Argentina and Lionel Messi aren’t out of the World Cup yet, but the mayhem that seems to have erupted from within the Albiceleste’s camp following their 3-0 loss to Croatia suggests internally and externally, very few still believe this team has what it takes to stretch their visit to Russia beyond the group stage. Messi and co. still have one more match to play – against Nigeria, and what chance they have in that match to still finish in the top two lies in the result of Nigeria and Iceland today. However, it seems that the main business now is finding who to blame for Argentina having just one point after two matches. Jorge Sampaoli is the one most fans and journalists are aiming for. His weird player selection, squad selection, tactics and game time decisions. Easy target. Perhaps the right one. But Messi’s poor performance, especially in the loss to Croatia, sparks again the debate on whether his greatness relies greatly on other players, perhaps more than some would like to admit. But this whole developing debacle has been some years in the making. The qualification process, the failures at the Copa America, Messi quitting and returning, changing head coaches and the dreadful preparation to this tournament which included 0 matches against noteworthy teams and a trip to Israel cancelled because of BDS pressure. A Diego Simeone chat with his assistant at Atletico Madrid was leaked, blasting everything about Argentina, the FA and even Messi over the last four years, blaming lack of leadership, structure and vision on how the national side looks. He isn’t wrong, even if he isn’t very happy about his words being out in the open. Messi never left his mark on a World Cup campaign. In 2006 he was just before his big breakout and didn’t take a meaningful part in an enjoyable run, stopped by Germany and a penalty shootout in the quarterfinals. Four years later, under the shaky guidance of Diego Maradona, Messi didn’t score a single goal before getting bulldozed by Germany again, losing 4-0 in Cape Town in an epic second half collapse. In 2014 Messi was fantastic in the group stage but almost non-existent in the knockout stages, which didn’t stop Argentina from reaching the final, losing to… Germany, again. 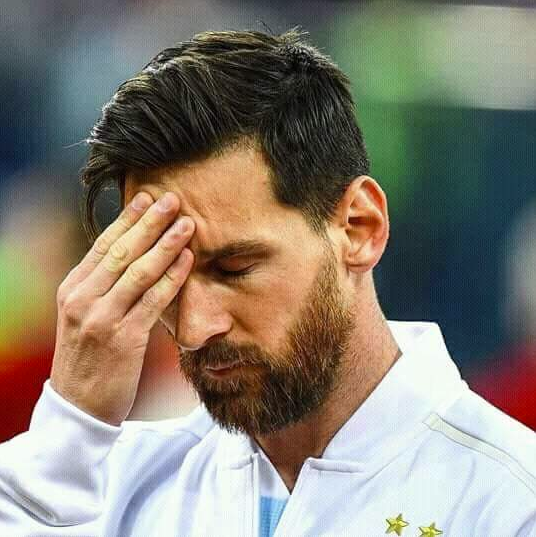 This time, in his last World Cup as arguably the best player in the world, Messi will leave a disappearance act against Croatia and a botched penalty kick vs Iceland. Yes, Javier Mascherano being the team’s most creative midfielder is joke, and so is Willy Caballero starting over Armani, alongside dozens of terrible choices made by Sampaoli, clearly out of his depth with this job. But Messi is the face attached to each of Argentina’s shortcomings and failures for over a decade. 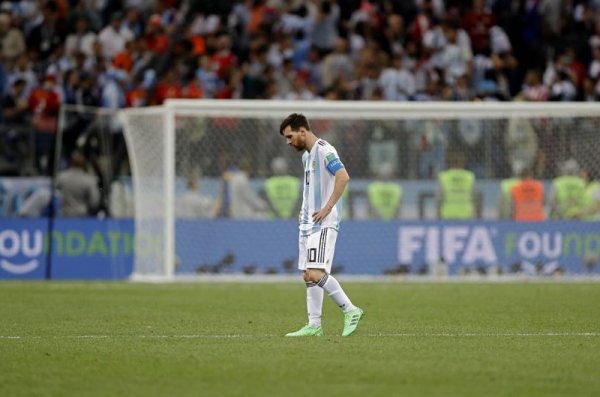 With or without the constant comparison to Cristiano Ronaldo, his dejected look will become the signature avatar as Argentina’s drought of major titles probably extends to 25 years and counting.